A vaccine is a substance that is made from dead or living pathogens. It is injected into the body through inoculation (intranasal versions have also recently been developed), which causes the body to create antibodies and, therefore, makes your cat immune to getting the disease in the future. What vaccines does your cat need, and on what timeline? What are the most common vaccines and what special vaccines may be needed? Find out more about common vaccines, some of the risks, and the appropriate timeframe for getting vaccines to keep your cat healthy. Chlamydiosis: Appropriate for households with multiple cats or where chlamydiosis infections have been confirmed, after vet consultation. Feline Infectious Peritonitis (FIP): A controversial vaccine, the AAFP (American Association of Feline Practitioners) currently recommends against its use. Bordetella: A recently-approved vaccine is not yet ready for common use, but may be used for multiple-cat environments on a case-by-case basis. Gardiasis: This vaccine is in a similar state to that for Bordetella, being too new for general use but can be approved when exposure is clinically significant. There are many different times when vaccination may not be appropriate, depending on your cat’s health situation. Cats that probably should not be vaccinated include: sick cats (particularly those with weakened immune systems or chronic disease), those receiving cortisone therapy, or kittens under six weeks unless in extreme conditions. Cats over 10 years old typically do not need booster shots. Finally, it is believed that pregnant queens may experience stillbirths as a result of some vaccines. No matter what the situation, always consult a variety of sources and talk with your veterinarian before making vaccination decisions. Kittens are usually first inoculated between six and eight weeks of age. This first round of shots consists of the FVRCP, which can be a three-in-one shot and vaccinates against feline viral rhinotracheitis (FVR), calicivirus, and panleukopenia virus. A booster round of shots is administered three to four weeks later and booster rounds continue until twelve weeks of age. Rabies shots, however, are not given until twelve weeks of age at the earliest. If you adopt an older kitten or cat, their initial vaccinations are normally given in one does or two doses that are three to four weeks apart. One dose is given when the vaccine is an MLV, or two doses of a killed virus vaccine are recommended. Once your cat has been vaccinated, they are usually put on an annual schedule of vaccinations. It is important for you, the pet owner, to keep track of vaccinations. Although your vet’s office will keep records and do their best to remind you, it is ultimately your responsibility to ensure your cat’s best health. More recently, pet owners and veterinarians have been forgoing an annual vaccination scheme, due to fears about Vaccine-Related Sarcoma. 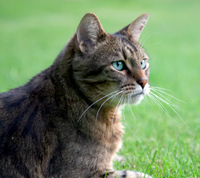 This condition is most often caused by the rabies or FeLV vaccines. Vaccine-related sarcomas occur when cancerous tumors grow at the site of a vaccination. A small, painless lump often develops at the site of a vaccination; in rare cases, however, it progresses to a sarcoma. Pet owners are encouraged to check a vaccination site for several months after the vaccination, and schedule a vet appointment if the swelling has become a solid lump. If your cat is an animal that spends all his time indoors, forgoing annual vaccinations may be a possibility. However, in general this tactic is not recommended and should only be considered under extenuating circumstances. Even if your cat will not be getting annual vaccinations, you should still bring him in for a check-up and testing. Be sure to thoroughly research any vaccination-related decisions and discuss the advantages and disadvantages with your veterinarian.